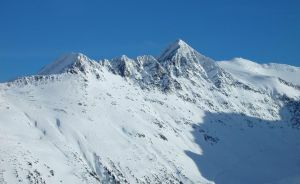 Tremor Mountain is located near the east end of the Spearhead Range southeast of Whistler, BC. There are three separate glaciers around the summit, and it's the highest mountain encountered along the traditional route of the Spearhead Traverse. The east ridge is the standard summit route. The summit provides excellent views in all directions and is a quick nip up for a fit touring party. There are steep descents to be had directly from the peak, with the north face often holding a good quality snowpack.